All new roll-on lawns can be an expensive option for many people, especially when we begin talking about new lawns for larger areas to be turfed. Buffalo grass is no exception to this rule, and can sometimes be more expensive than other grass types such as Couch and Zoysia. But even within the price differences between grass types, we can also see that some brands of Buffalo grass can be more expensive than others. For people eager to cut the costs involved in buying a new lawn, other options such as planting a new lawn from start with grass seed, rather than buying a roll of turf from a farm, are considered. So the question is … can Buffalo grass be grown from seed? The short answer is no … and yes… and sort of. Sound confusing? It probably does, so let’s explain. Buffalo grass is notoriously bad at growing from seed, this is why we cannot find Buffalo grass seed for sale, not only in Australia, but also around the World. This is also why Buffalo turf growers will never harvest their entire crop of Buffalo grass, but will instead always leave strips of turf behind for the new crop of Buffalo to grow from. In this respect, Buffalo grass cannot be grown from seed either by the turf farmer or the homeowner with any degree of success, so will therefore be a waste of time to even attempt it. Some Turf Breeders do indeed breed and grow new Buffalo grasses from seed during their development and breeding cycle, but it’s very rare. They do this with massive quantities of seed which is often selected and blended and then planted in the same large quantities in order to obtain a few new grass plants for further selection. This is ‘real’ Buffalo grass turf breeding and we’re only aware of a single brand of buffalo grass developed and sold in Australia today which was bred in this manner, which is Sapphire®. Instead, due to the difficulties involved in Buffalo turf breeding, based on the difficulties of breeding and growing this grass from seed, most Buffalo grasses which are claimed to have been bred were instead ‘selected’ amongst naturally growing variants. What this means is that the new Buffalo grass naturally developed different characteristics on its own and adapted to different growing conditions. Interesting, isn’t it. 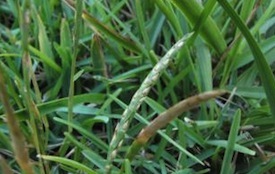 The grass simply adapted itself to new growing conditions. The story of Buffalo Turf Breeding is simply to show just how difficult it is for anyone to grow Buffalo grass from seed. The homeowner can’t do it – it’s too difficult. The turf farmer can’t do it – it’s too difficult, and would be too expensive and time consuming. Most Buffalo Turf Breeders can’t do it – it’s also too difficult. In fact, only a real Turf Breeder could ever pull this feat off, and it has also been done with some Buffalo grasses developed in the United States. So for the homeowner wanting to grow a new Buffalo grass lawn from seed, they would be best to look at other low cost options such as growing Buffalo grass from Buffalo runners or from Buffalo plugs. Growing a new Buffalo lawn from seed is just too difficult!